Case: An investigation of a general lines and health agent revealed that he was pocketing premiums of his customers. Several customers had paid premiums to cover their homes either for a flood insurance policy or a homeowner's insurance policy. However, when they received cancellation letters in the mail, they realized that their payments were misappropriated. An employee of the insurance agency noticed the discrepancies in the escrow accounts and alerted the company officials. A review of his business accounts found that he deposited the checks but then drafted counter checks and withdrew the money for personal use. Disposition: The agent pled no contest to scheme to defraud, a felony, and was adjudicated guilty. The agent was sentenced to 60 months probation. In addition, he was ordered to repay $15,563.00 in restitution. As a result of the felony conviction his insurance license was immediately revoked by the Department and he is permanently barred from applying for licensure in the future. Case: An investigation of a customer representative revealed that she assumed the identity of someone she knew and managed to steal more than $2,000. She made unauthorized transactions using the victim's credit cards and even went as far to order checks from the victim's checking account in her name and the victim's even though she was never listed on the victim's account. She was then able to write five checks by forging the victim's signature to be able to obtain cash and pay her own rent. Disposition: The customer representative pled guilty to organized fraud, a felony. She was sentenced to 90 days in jail and three years probation and ordered to pay restitution to the victim and $2,081 in court fees and costs. As a result of the guilty plea to a felony her insurance license was immediately revoked by the Department and she is permanently barred from applying for licensure in the future. Case: An investigation of an agent approved as a School Official and Instructor for licensing and continuing education courses alleged he unlawfully disseminated copyrighted study aids to his students. Disposition: License surrendered for one year. Authorization as a School Official and Instructor suspended for 90 days. Fined $5,000. Restitution of $2,160 to the owner of the copyrighted materials and $300 to the Department. Case: An investigation of a licensed insurance agency and its unlicensed owner alleged that they permitted unlicensed individuals to transact insurance, impermissibly used an insurance agent's license and impermissibly signed an insurance agent's signature by submitting applications and other insurance related documents to insurance companies under the name of an agent no longer employed with the agency, and failed to notify the Department of a change in the agent in charge for the agency. The unlicensed owner had also applied for licensure as an agent, which was initially denied for transacting insurance without a license. Disposition: The unlicensed owner was banned for three years from applying for licensure as an agent. He was required to sell the agency within six months from the date of the action, at which point the agency license was surrendered and is not eligible for licensure again for three years. Case: An investigation of a public adjuster alleged that she entered into an agreement to settle a claim on behalf of the insured with the insurance company. This agreement did not contain statutorily required statements. She then submitted a letter to an insurance company requesting re-opening of a claim on behalf of the consumer while she did not have an active appointment. She also failed to update her business address with the Department. Disposition: License suspended for one year and fined $250. 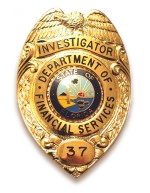 Case: An investigation of a title agency alleged that an officer of the agency made a material misstatement on its application for licensure by failing to divulge a pending civil case filed against three of the partners of the agency by a title insurance company. Case: An investigation of a bail bond agent alleged that he executed bail bonds in Florida after judgments were entered and remained unpaid for thirty-five (35) days. Disposition: Fined $1,500 after all judgements were satisfied. Case: An investigation of a life and health agent alleged that he sold consumers health insurance plans from unauthorized insurers AIM and CEO. When the consumers had medical claims they were informed there was no coverage and the consumers suffered significant financial harm. Disposition: Fined $1,000 and investigative costs of $1,000. He was also ordered to disgorge all commissions received from any and all of the contract plans or policies he sold and must satisfy all unpaid claims or losses for all persons entitled to coverage for the policies he sold.